A video had emerged on Instagram of a tiger being hit across the head. @Jackson13Walasek How would you tell a tiger what they are doing is wrong? There is a reason for this to have happened, it’s not like it’s a common occurrence. 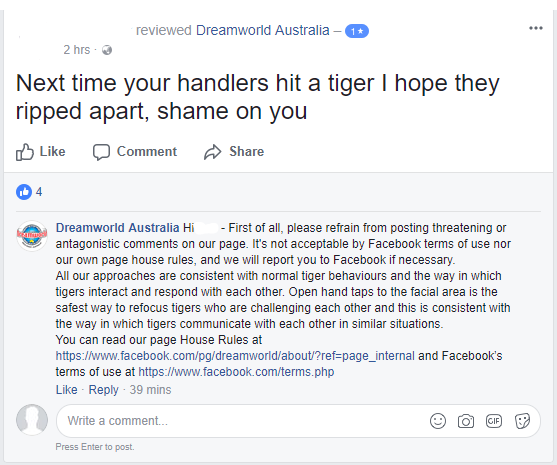 The reason for the post if more for the media already reacting to it negatively without a response from Dreamworld themselves. Why have you called it animal abuse? I read it as you think it's animal abuse. I believe this is common practice from all tiger handlers and I have seen it at DW myself. You see it more with the cubs but they get a tap on the nose. Itd be a concern if they were punching them all day every day, but that’s not what’s happening here, it’s at best a solid tap on the nose to re-inforce good and bad behaviours. It's clear that they're trying to separate one cat from another. The one corrected was clearly moving up into the blindspot of the other. It's stalking behaviour. I have dogs and a cat that do the same thing to each other constantly. These guys spend a lot of time with the cats. They have a huge bond to be able to walk around in an enclosure with several of them without much fear (although there have been incidents). The last thing they want is a bully stalking a cat they don't particularly get along with, with a savage brawl ensuing - resulting in severe injuries, and possibly death of one of these great cats. I haven't read anything other than this thread, and watched the video. This is not abuse. This is correction behaviour to prevent a worse situation. And now i've read the article posted on Parkz with the statement from Dreamworld - and it's pretty much the above. Media need a good flogging. This review made me LOL. 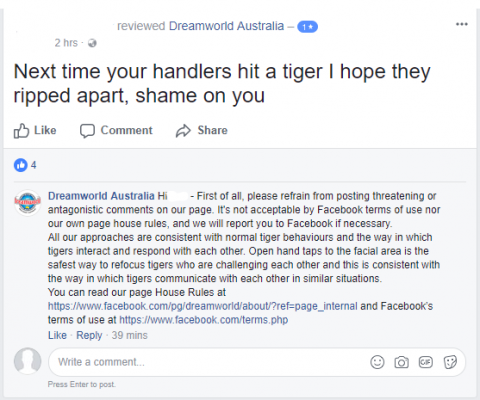 Good on Dreamworld for firmly correcting that idiot, although it's a shame they can't correct them the same way the tiger handlers correct the tigers as that would probably work better for someone that thick! You're quite right. I stand corrected. Perhaps more of a hefty kick in the stomach? Looks like they couldn't handle the heat. I must say though it was starting to get a bit out of control with the one stars. 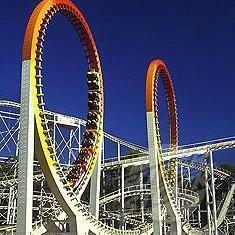 Why do theme park enthusiasts think they are better than anybody else? I’ve see people from this site laughing at DW predicament and I’ve seen other people like the co-host of Park Chat Live calling people potato heads on DW Facebook site. I haven’t seen one person besides Alexb construct a reasonable argument on DW Facebook page. It’s embarrassing as a community that we act like this. The parks must really laugh at us. If you don’t know how tigers should be looked after and let’s face it, most of us don’t (including me) than we should keep our mouths shut. Just because it’s happens in a theme park doesn’t suddenly make us an expert on tigers. Here's the thing - i'd put my name behind Tiger Island - the team there live & breathe those cats, and i've spent enough time back of house there doing film work and whatnot to really vouch for the quality of care they all receive. And that's backed by the fact that they're also the biggest contributor to conserving wild tigers anywhere in the world - seriously, no one gives more shits than the team there. The problem here, at least in my mind, is the same thing that happens when people are faced with the harsh reality of where their meat products come from - turning livestock into tasty steaks has a few real world realities people forget about, just like how there's real world realities in keeping endangered, wild apex animals in captivity for the purposes of conservation, breeding & education. The only way you keep a species that's typically not a pack animal in captivity is by spending a lot of time and attention on ensuring boundaries and checks are established with those animals, and this video that's gone viral is the reality of what happens when large predators want to test those boundaries and checks. Let's be also really clear, there's no punching here, and it's absolutely not like pulling your cat's tail, but people are clearly imposing those ideas onto this situation because the reality is these tigers look just as cute and cuddly as the domesticated counterparts, despite the fact that they'd rip each other and the handlers into shreds given half the chance. The simple reality is, their tails are far, far stronger than your everyday cat, and the studied & documented way to re-enforce large cat behaviour (that's sanctioned by both RSCPA and many zoo-oligical societies) is 100% what these handlers did. Again, saying you can't hit your kids and thus they shouldn't hit the tigers is ludicrous. They're not hitting or punching the tigers for one, they're tapping them on the nose (as do other cats), and let's not forget that unlike your kid, big predators don't understand logic and reason or cause and effect, so the kind of rationale that you can somehow talk to wild animals and they'll listen like your just like your kids is bafflingly out of touch with reality. Guys, they're wild animals, and they are treated as such. You'd make Dreamworld wrong if they didn't and they hurt someone or hurt another tiger. People freaked when a tiger in a Chinese zoo mauled a live animal, something that happens in the wild. Where's the line? You want tigers in the wild but somehow you want the problem of them being poached to magically solve itself? Lemme guess, you want no tigers at all in captivity but don't have an alternative to preserving numbers? This is the best solution we've got, and thanks to Dreamworld & Tiger Island, it bloody works, and their efforts should be applauded, not condemned. It's unfortunate in a way that the administrator of a Facebook page cannot delete reviews, other than maybe by asking Facebook to do so. It's more unfortunate that a lot of pathetic people abuse the Facebook review system to give 1 star ratings on the basis of something stupid such as this. 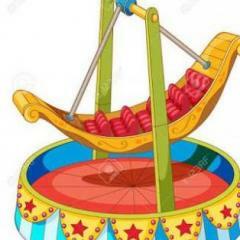 Each star rating affects the average rating everyone can see, hence someone who knows nothing about Dreamworld could check their page and potentially see a completely unfair low star rating which may not be at all representative of what the vast majority think of Dreamworld. Hence I completely understand why they'd disable reviews. Sad.